ESPN needs no introduction when it comes to sport streaming. If you are a fan of sports, no matter what it is, you definitely know ESPN as it covers major broadcasting of all the sports events from cricket to football. 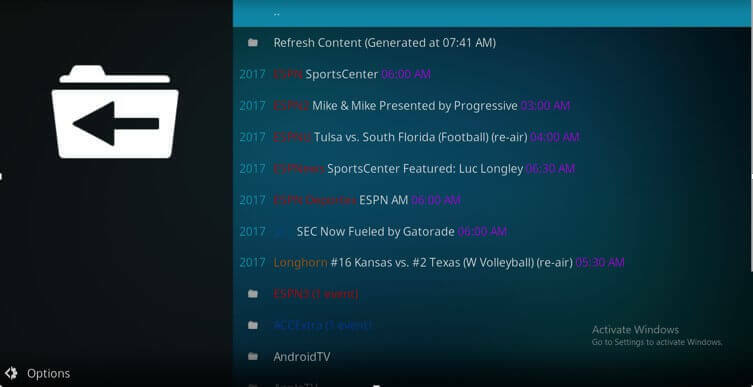 ESPN offers online broadcast on a number of devices and it can be access on Kodi as well. 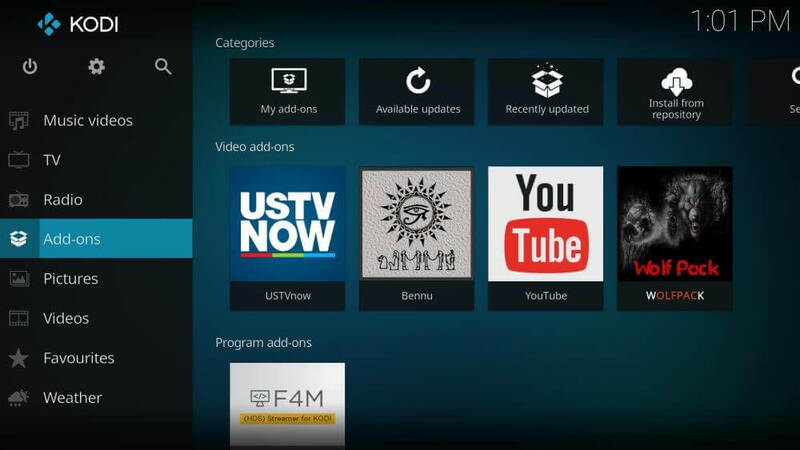 Of course, you can use Kodi to access the channel outside America and without subscription. And, there is a long debate on the legal matters involved here but let’s focus on getting ESPN on Kodi. Here in this guide you will learn how to watch ESPN on Kodi. How To Install ESPN On Kodi? ESPN has grown into the giant network now. It has many other channels like ESPN2, ESPN3, ESPNews etc. Also, it has launched local ESPN channels for countries like Brazil, Australia, Latin America, United Kingdom etc. These channels broadcast sports relative to the country. Kodi has a third-party addon for ESPN. In simple words, ESPN Kodi addon is not created officially by ESPN. Some third-party developers have combined their minds to create this gem. We are happy in any case as we get to watch ESPN on Kodi. So in short, to get ESPN on your Kodi player, you need to install the unofficial addon. 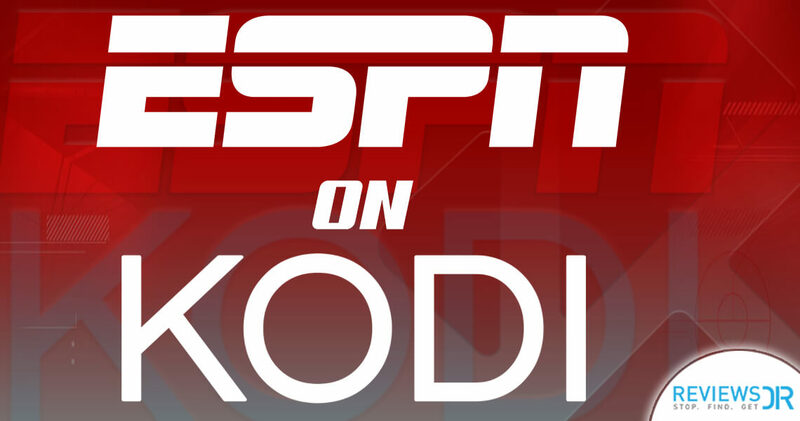 Our guide will explain you easy steps to install and watch ESPN on Kodi with the native addon. 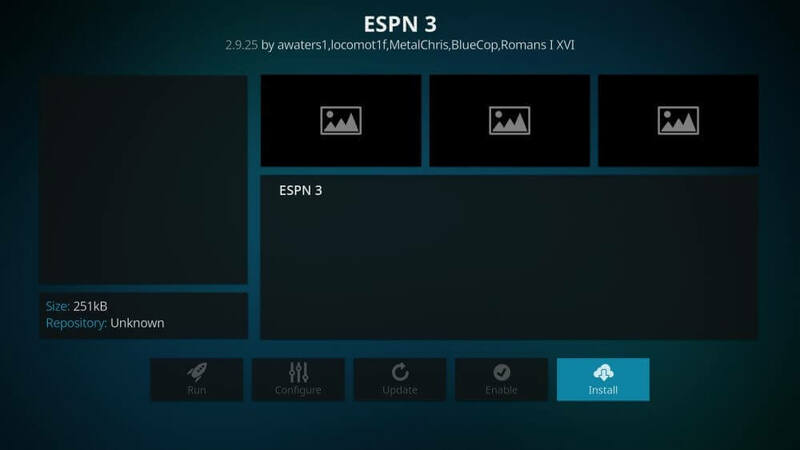 The easiest way to get ESPN on Kodi media player is with the help of third-party addons. Now as we know that Kodi community actively contributes to making it more convenient for all users, you might find several addons to help you stream ESPN on Kodi TV. However, as per our experience with Kodi, not all available addons are good, and you need to be very choosy while installing any third-party addon on your Kodi media player. While reviewing the best addon to watch ESPN on Kodi, we found the following more reliable and efficient compared to other available options. Installing procedure of above listed ESPN Kodi addons are more or less the same; however, we are going to explain the how-to guide to install ESPN on Kodi with the help of ESPN 3 Kodi addon. As an internet security advocate, we owe it to you to tell about the implications of using Kodi and third-party addons. Kodi is an open source media player, which means anyone can develop addons that can work on the platform. Kodi has no power over the addons created by outsiders. There is a solid chance that you may end up watching pirated content on Kodi, thanks to third-party Kodi addons. The copyrights trolls are constantly in search of people who are misusing Kodi for viewing pirated content. Usually, the violators get a legal notice or warning but in some cases, you can be fined heavily. The punishment can vary in different countries. ESPN, founded in 1979, have become one of the biggest sports broadcasting network with ABC. In 2017, Nielsen reported just under 90,000,000 subscribers of ESPN. The channel can be caught live via Kodi as well. ESPN, being the prime sports channel, has a long list of sporting events and programs. You can watch cricket, football, baseball, tennis, hockey, swimming and many other games. 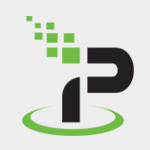 It covers major sporting events like college football, NBA, NFL, Olympics etc. ESPN has developed a signature line of programs that attract millions of viewers. It has divided programming categories into news/analysis, talk/debate, original series, game telecasts etc. Baseball Tonight, NFL Live, World Cup Live, Highly Questionable, Winners Bracket, Barstool Van Talk, 30 for 30, World Series of Poker, ACC Wednesday, Wednesday Night Baseball etc are some of its popular shows. The channel has a history of being criticized for its programming choices, biased coverage, conflict of interest, issues with individual broadcasters and analysis. Also, ESPN has been accused of giving priority to men’s sports over women’s sports matches. We cannot argue or decide whether the criticism is justified or not. However, we can vouch for ESPN’s dedicated commitment to the world of sports. You will be doing yourself a huge favor by downloading ESPN on Kodi. ESPN is a legend when it comes to sports TV channels. Downloading ESPN Kodi addon means you don’t need any other sports addon for Kodi. However, you should be careful about two things. First, ESPN is not an official addon. Secondly, you must use a solid VPN while watching anything on Kodi. Were you able to download ESPN by following the above-mentioned method? Let us know in the comments section below.